Our coaches from all over the world are here to serve you and your family! You can join our team of worldwide WISDOM Coaches! The following coaches have completed their certification and have submitted their directory information! Many of our coaches have not submitted their directory information. If you don’t see a coach in your area, send us an email ([email protected]) and we’ll see if we have a certified coach near you. Whole child coaching will introduce your family to a new way of relating to one another, bringing you closer together while nurturing self awareness, social awareness, relationship skills, self management, and responsible decision making. Whole child coaching workshops and sessions are founded on research based social emotional learning practices. The goal of our sessions is to nurture SEL learning practices at home through activities, games, art projects, and videos, that are fun for the whole family. As a character education teacher, Hannah taught over 500 students a week and collaborated with classroom teachers as well as principals developing a school culture that encouraged children to be aware of themselves, their peers, teachers, and their parents, and through this to manage their emotions, overcome challenges, conflicts, make responsible choices, and contribute to their surroundings. Hannah has also written and taught “Me and My Community” (lessons in social awareness and social responsibility) to groups of children and teens in transitional housing. Hi! Debra Ann Del Sardo here! I have been on my ‘Teacher Journey’ for the past 40 years; teaching many age groups. I am recently retired. I hold a BA in Education from William Paterson University, MA in Curriculum and Instruction from Caldwell College; I am a Teacher Consultant with the National Writing Project at Rutgers. I have been conducting monthly workshops for Tweens since 2013. My Mission Statement: “To empower today’s youth, particularly Tweens and Teens, to be confident in themselves through changing their thoughts and actions while affirming who they are and desire to become.” I am currently conducting a Tweens’ ‘Meet-up’ every Friday afternoon from 3:30-5:00 P. M. at Soulful Awakenings, Lake Como, NJ. As we ‘RAISE’ and empower our kids to be confident in themselves and what they can achieve, we ‘RAISE’ the HOPE for our world! Having spent 28 and more glorious years as a multi-level, multi-faceted classroom teacher/professional storyteller, educational consultant, aerospace educator and mother of teens, Dianea’s experiences have served her greatly in inspiring young people to recognize their talents, skills and personal contributions in life. Dianea is incredibly passionate about helping young people realize their pitfalls and the potentially hazardous effects of self-limiting thoughts. Her clients have nicknamed her the “Morphologist”. Why? Because when people work with her, just like caterpillars turn into butterflies, they too change! Dianea is committed as a PPCC Life Coach and Adventures in Wisdom Youth Coach to help our youth understand that they are the creators and the designers of their lives. Learning how to change habits, patterns, think their own thoughts, be accountable for their decisions while taking baby steps towards personal transformation. They are WORTH IT! Amanda Burgess (Coach Ms. Mandy) is a certified WISDOM Coach for kids through Adventures in Wisdom. She has a strong background in working with children and have been doing so for over 22 years. She is passionate when it comes to helping kids create a positive and powerful vision of their lives. She feels it’s more important than ever for kids to have a solid, strong mindset so they can be ready to take on the world! It's Amanda's goal to support children and their families in a way that will empower every child to see their full potential, their inner-greatness and to help them achieve their goals with confidence. She looks forward to meeting with you and your child, to get them on the positive path for success. As a certified life coach with a degree in Educational Psychology, specializing in emotional and behavioral problems, adding WISDOM coaching to my credentials was a no brainer. Although I love working with adults, children and adolescents will always be my passion. Children should feel empowered to overcome obstacles on their life paths. I want to give them a “passport” in their hand to go wherever they want to go, to know that they are worthy, that they are in control of their lives and that they can live life to the fullest. As a result, I started developing My Passport to Happiness. When I came upon The Adventures in Wisdom Program I just knew this was going to be such a part of my program and I had to get certified. I hope that through fun filled workshops children will go away and know that they are ready to travel on their life paths, knowing that they have the skills to conquer what ever comes their way. My mission is to enlighten youth to the power of the mind and to teach them to use that empowerment as they face challenges in life. Teaching kids to focus on their strengths, how to increase their self-confidence and how to attract their dreams is a deep passion of mine. I also teach mindful and visual meditation techniques to help with emotional stability, improving attention and connecting with intuition. I am a certified Wisdom Coach and certified teacher with ten years of experience working with youth. I hold a BA in Psychology and an MA in Education. My 4-year-old daughter keeps me fresh and always wanting to deepen my learning experiences and become who I am meant to be. I am always in training and striving to make improvements within myself in order to help others do the same. At Dream Beautiful Personal Development for Kids I offer workshops as well as individual coaching. Vicky is a certified Adventures in Wisdom Coach has a Associates Degree in Early Childhood Education is a Montessori Certified teacher for ages 3-6 years old, a Mom of two kids 13 and 10 years old and a Reiki Master. She is passionate about helping kids to have amazing self-confidence and awesome self esteem to be themselves and help them build their value system, handle mistakes, peer pressure and much more. She wants kids to notice how they view the world, that they can shift (change the way they think) and make their view on life even BETTER. With a better view on life ANYTHING can happen. Giving kids these tools now to navigate thru the preteen, teen, and adult years is a gift they can use for a life time. All my life I have enjoyed being in the presence of young people. While I was working in the corporate world I still found time to work with middle school students around learning life skills and understanding business. I have also worked with young people who found high school hard to navigate and needed mentoring through that journey. Over the past several years I have been volunteering in our local school focusing mainly with young people from kindergarten through fourth grade. I believe that, given the opportunity, every person can recognize their whole potential and live a truly happy and fulfilled life. As a certified WISDOM Coach, I bring my passion and talent to work with young people so they will know themselves and appreciate their unique gifts, talents and skills. Through story-telling and conversation they will gain confidence, become more resilient and set the course for living their best life. Michele has studied Holistic Health and Wellbeing for over 17 years. She is passionate about the well being of women and girls worldwide. She is a certified Master Empowerment Coach for Women and a certified Adventures in WISDOM coach for kids. Michele is at the leading edge of how to live an authentic life and guiding women on their journey of personal transformation. Knowledgeable, authentic and gentle, she shares her passion with women & girls by teaching them how to align themselves with their inner truth and discover their gifts. She teaches girls the tools and strategies to develop strong self-confidence, higher self-esteem and mindset development to be leaders in their own lives. She is a mother of three beautiful children and wife to a loving husband of 13 years and lives in a small town in North Eastern Alberta, Canada. Soul Sensational offers, yoga and meditation, Sensational Meditation and Chakra Balance and Therapeutic Yoga/Meditation Program for children with special needs. Along with many workshops on Reiki healing for kids, connecting with your Angels, learning about Chakras and more. I am so excited to implement Adventure in Wisdom Coaching for kids with our existing programs. I am a Reiki Master/Teacher, Girl Scout and Cadet leader, An active Volunteer and Committee Member for Child and Family Services. My goal and aspiration is to implement both the Coaching and yoga/meditation programs in our schools, YMCA, boys and girls club. I am a certified Adventures in Wisdom Coach and a Graduate of the International Coaching Academy based in Australia. I am also a licensed Massage Therapist, Certified in Hypnosis, and a Reiki Practioner, I am a mother of three and grandmother of ten beautiful grandchildren. My passion is to empower children and parents using the different modalities I practice. I am highly connected with my intuition, this special gift enables me to sense limiting beliefs and barrier that may be keeping parents and/or children from their potential growth and life goals. As a professional coach I will work with parents and children on the specific needs of their family unit and their family lifestyle. I believe with all my heart that each child can BE LIMITLESS in their life, learning to step out of their comfort zone, conquer fears, take on self-responsibliity and go for their dreams. Hi, I’m Delia! If your daughter is struggling with low self-esteem and a lack of confidence, and no matter how much you try to encourage her, it doesn't seem to help, let’s talk! As a mother of two teenage girls, I've experienced these challenges first-hand so I have created fun and engaging programs to help girls believe in themselves, make good life decisions, and go after their dreams. Not only that, but I have tested all my programs thoroughly with my own daughters, so I can attest to just how effective they are! Imagine if you could give your daughter the tools and resources to develop powerful self-esteem and unstoppable self-confidence so she feels worthy, happy, and prepared to lead a wonderful life… Wouldn’t that be something? I am leading a movement to bring personal development tools to kids and their parents so that they can feel fulfilled as a family and in life. If you are a parent who desires proven methods to empower your children, then join my FREE Adventures in Parenting Community (link above). This community is for all parents who want their children to: • Understand the power of the mind and why we achieve what we believe. • Chose who you want to be and stand up to peer pressure. • Develop soaring self esteem and powerful self confidence. • Create your vision, achieve your goals, and manifest your dreams. • Learn to bust through fear, failure, mistakes, change, and go for your dreams. Looking forward to meeting you in our FREE community! Through stories, discussion and activities Sebrina teaches children lifetime strategies and tools to stand tall throughout life. Her own children have been and still are her greatest teachers. She has been witness to many young people who are leaving high-school, university or college fearful of their enormous feat. She feels that what used to be exciting for us to graduate, start our careers and grow as individuals, is the most frightening thing to young adults. Not being liked, not getting that job, not winning, used to be lessons for us and are now markers of failure to these young minds. It is her personal mission to positively influence children’s mindsets, a cause which she is extremely passionate about. Empowering children to use the power of their mind and thoughts to create happiness, confidence and success. We can’t beat the pressures our kids face in today’s world but; we can give them the tools to succeed and stay strong and stand tall. As an educator in the Canadian public school system for over twenty years, Kim has always integrated life coaching techniques into her work with students. Her passion is to teach kids how to challenge themselves in the classroom. She skillfully creates opportunities that coax them out of their comfort zones. Kim began teaching at the elementary level then transitioned to secondary education where she worked with adolescents for 11 years. In 2011, she traveled to Uruguay with her then 4 year old daughter, where they embraced the unfamiliar and stayed for a year and a half. Since returning, Kim has been teaching full time at a Spanish bilingual school in Calgary. As a certified WISDOM Coach, Kim strives to help kids recognize that they have limitless potential that can be unlocked by learning how to harness the power of their thoughts through storytelling and creative strategies. Kim is the founder of Hero Wisdom Life Coaching for Kids. She offers workshops and small group sessions and works individually with kids, tweens and teens. Bridget C. Hill, CPCC, ACC is a certified co-active life coach through CTI and the International Coaches Federation. She is also a certified WISDOM Coach for kids. Bridget specializes in coaching kids 6-12 years old dealing with hard life situations such as divorce and step families, single parents, military parents, shyness and bullying. She has a passion to help kids learn, grow, trust, and believe in themselves. She wants them to know they are more than their situations and the circumstances that happen in life. Bridget believes that through coaching, each child can gain valuable understanding of how to deal with a variety of life situations. It is by teaching children these life skills that we build hope for the future. Terri's passion is working with kids focusing on helping them create a mindset that allows them to become leaders of their own lives. Terri was ELATED when she found the Adventures in Wisdom program. As a certified WISDOM Coach, she now has more opportunity to help our kids as future leaders THRIVE-not just SURVIVE in life! Terri partners with kids in small group workshops as well as one-on-one to teach them critical life skills so they can make their own choices to be unique, confident and respectful to themselves and others. She has worked with kids for the past 15 plus years as a member of the Optimist Club-Bringing Out The Best In Kids, bicycle safety training and repair, mentoring 4th and 5th grade Junior Optimist Club projects as well as being a Special Olympics volunteer. Terri has previously coached elementary school girls’ softball, basketball and mixed Junior Olympics track. Currently, she is a member of the Optimist Club Las Cruces and Soroptimist Pinellas County serving youth and women. Monika has been interested in helping people overcome challenges and expand their experiences since she lost a loved one and witnessed friends and family members giving up when the storm hit their marriages. Now, she coaches couples, professionals, children and individuals to grow and maximize their strengths, reach their potential and achieve results. Her passion as a volunteer, working with couples and witnessing first hand their children's reaction and lack of confidence, led her to become a Children’s Life Coach. All of her life experiences made her stronger, bolder and passionate about life. She is now a mother of two girls with one child on the way. She is originally from Europe, but now lives and works near Ontario, Canada. As a coach, Monika donates a portion of her profits to worthy causes, such as local schools and daycare facilities. She loves to combine her understanding of relationship coaching with WISDOM Coaching to help others make positive lasting changes. As the Founder of BRILLIANT MIND – an organization built on the premise of empowering children and their parents, Earlene believes that children have the strength to own their thoughts and live brilliant lives. Her organization is focused on empowering and developing a generation of mindful, healthy, successful and confident children. I empower Highly Sensitive Children between the ages of 7-13 to embrace their sensitivity as a gift so they can develop sustaining self-confidence. From a very early age, I felt like I didn't belong and something was wrong with me. I know now that I'm a HSP (Highly Sensitive Person). When I was young, I didn't know this label nor did I understand it. Because I was so sensitive, it led to years of bullying and being made fun of. As I grew, so did my lack of confidence. My healing journey led me to my life’s purpose – to teach children life skills that foster self-confidence. My coaching practice is unique because I teach both intellectual and intuitive skills. With the WISDOM curriculum, I teach children how to use the power of their minds and the power of their thoughts to create self-confidence. With my REAP program I teach children how to reclaim their personal power by tapping into their intuition for daily guidance. My career began in the Psychological/Medical arena at the University of Calgary, correlating psychological and physical experience of headache pain and counseling patients to deal with that pain. After marriage and family, I began facilitating in the corporate world teaching International Presidents and CEO’s a unique form of peer to peer mentorship (YPO FORUM). This experience highlighted that we ALL have issues and challenges to overcome no matter HOW successful or mature we appear. Recently, I received my Louise Hay, YOU CAN HEAL YOUR LIFE Facilitation and Coaching Certificates, providing workshops and individual coaching for those seeking to change negative thinking and behavior. I loved finding and becoming certified in Adventures in Wisdom as it provides an avenue for early learning of these essential life skills in a realistic, non-threatening fashion. It employs solid ideas, strategies and choices to instill self-confidence, self-belief when we need it the most! I am now incorporating this program into the curriculum that we use at our RETREAT CENTER, RiverCross Ranch, just west of Calgary, AB, to meet the needs of children and young adults in our community. Sharon Higham, transforming u, changing people's lives one habit at a time. Sharon works with parents to help children with esteem and self-confidence. A good referral for me would be a parent going through a traumatic family event, who needs support in helping their children feel good about themselves while they watch their family fall apart. Sharon Higham, transforming you, change your habits change your life! Are you the you, you want to be? Do you muddle through life, wondering if you are as good as someone else? If the answer to either of these questions is Yes, then schedule a free strategy session with me today. My mission is to enlighten youth to the power of their mind and to teach them to use empowerment as they face challenges in life. My passion is teaching kids to focus on their strengths, how to increase their self-confidence and how to attract their dreams and passions of mind. I have been involved in transformation for the past 25 years. My coaching technique centers on the ontology (Being) of a person and getting to their source or story (or “What Happened”). One’s interpretation is critical as it opens up the way to authenticity and a new creation of “What’s Possible”. I am a certified WISDOM Coach for Kids. I work with kids, through stories, to build authentic relationships with families and empower them in their lives. Families are always committed to work-ability! Gloria Dickerson’s passion is to inspire children to discover their gifts, talents and passions and to use them to create a healthy, happy, and whole life. Her niche is children whose parents cannot afford to send them to coaching or therapy. Having grown up in poverty herself, she knows what it is like to need coaching and guidance, and not be able to afford it and/or is not aware that you need it. Her goal is to offer children the inspiration they need to create a beautiful life in spite of their socioeconomic circumstances. Gloria believes that each child has the inner power to create a future that they desire, and she coaches them on self-esteem, self- confidence, self-worth, and faith. She helps them to get in touch with who they are and how to use the power of the mind and their thoughts to create their reality. Gloria is a certified “Heal Your Life Facilitator and Coach”. She is also certified in “Mindful Schools”, “Infinite Possibilities”, “Playing the Matrix”, and “Adventures is Wisdom Youth Coach”. In addition to coaching, she conducts workshops and seminars to raise awareness in youth and adults and assist them in learning and practicing the healthy habits included in the curriculum so that they may create wonderful possibilities. Ms. Jessica is the founder of Calm and Colorful as well as a mindfulness coach for children. Teaching children meditation and mindfulness came naturally to Ms. Jessica that she began teaching mindfulness techniques to the kids in her life without even realizing she was using mindfulness. Following her intuition, Ms. Jessica has grown beyond her work in the classroom, focusing on coaching children in various settings. Known for working with children all over the world, Ms. Jessica meets children at their level to show them mindfulness, self-confidence and self-awareness. I was delighted when I found the Adventures in Wisdom program. As a certified WISDOM Coach, I have more opportunity to empower kids as future leaders. This certification, builds upon my background in education. I have a degree In Lower Elementary and I am a Montessori Certified Teacher for 3-6 years olds. I have over 25 years of classroom teaching experience, working with students aged 2-11 years old. My mission is to guide youth to use the power of their minds. I feel so blessed that I have found the Adventures in Wisdom curriculum! My passion is to help kids create a positive and powerful vision for their lives. Please connect with me through email or Facebook with questions or to make an appointment. Kamini is a certified life and wellness coach. She is board certified through the AADP. As a mother of five children, empowering tweens and teens is her passion. Kamini feels deeply that life coaching should readily be available to children and teens just as it is for adults. Therefore, she is also certified as a WISDOM® coach with Adventures in Wisdom. Today, her practice focuses on tweens and teens. Kamini helps these individuals anchor themselves in authentic self-esteem and identity so they can navigate confidently through academics, performance and social aspects of life. Kamini offers one-on-one coaching either in person or video teleconference as well as small groups and workshops. I'm a mom of five humans as well as five furry babies. I’m also a certified Life-Coach and a certified WISDOM Coach for kids. Before finding my life purpose through coaching, I was a children's photographer for many years. I love being around kids as much as they love being around me. I'm passionate about empowering children to create the life of their dreams. I have an abundance of love, kindness, and energy to share with the world. Having experienced a difficult childhood myself and have therefore made it my life's purpose to give children the tools they need to push past limiting beliefs, stand in their power and believe in the seemingly impossible. Life is beautiful and should be enjoyed to the fullest. Please visit my website or contact me by phone or email to schedule an appointment. My passion is to give your child the tools to become a “Yes I Can Kid”- a “Yes I Can Kid with a “Can Do” attitude to pursue his or her dreams by enhancing self confidence, self responsibility, goal setting, growth mindset, social skills as well as conquering peer pressure, test anxiety, and negative self-talk. As a 30-year veteran teacher (MA), I have worked with countless students and have seen first-hand what kids experience. The lucky student learns to value uniqueness and what makes him or her special. They learn the tools to pursue their dreams, overcome challenges, and grow. As a certified Wisdom Coach, I use stories, projects, activities, and problem solving scenarios to empower kids. Empowered kids become empowered adults! Please contact me with your questions or to make an appointment. My name is Charlene and I have a wonderful husband of 37 years, 2 amazing adult children and 4 heart filling grandchildren. I am a Certified WISDOM Coach, a Learning in Action Practitioner (EQ), a Personality Dimensions Trainer (Colours) and a CPCC Professional Coach from the Coaches Training Institute (CTI). I am also credentialed as an ACC from the International Coaching Federation (ICF). I have over 30 years experience in facilitation, instruction, mentoring, coaching, and supervision/management. I retired from my career in Fitness & Wellness in 2017 and decided to continue to follow my passion of coaching. My heart led me to coaching children who are sensitive and emotional. My mission is to bring personal development tools to children and parents so they can gain the awareness and skills that help manage the child's emotions and sensitive nature. I run workshops as well as one on one coaching for both children and parents that combine WISDOM coaching, Personality Dimensions and EQ. My belief is that children deserve to be given these tools that empower them to see their sensitivity as a gift and to allow them to perform better as who they are, in order to live a successful, happy and confident life. Please contact me with questions or to schedule a coaching session. Dimple Arora, contributing author of the best-selling book Simply Woman, is the founder of Mindful Evolution (ME) — a mindful parenting movement that aims to empower parents and children towards self-love, forming positive connections and taking inspired action to be the leaders of their own lives…one thought, one emotion and one choice at a time. Dimple is a Certified WISDOM Coach for children ages 5-14 who want the tools to confidently navigate the ups and downs of growing up. She is the creator of the GLOW (Girls Lighting Our World) Power Circle which helps girls 11-14 years old learn to know and love who they are. Dimple is certified in life coaching and alternative healing modalities such as emotional freedom technique and energy medicine. She holds degrees in mathematics, business, and education. She was previously employed in the corporate world and as a high school math teacher. As a Registered Holistic Nutritionist and a licensed Heal Your Life® teacher, Dimple is a “foodie” who advocates for healthy, authentic living. Dimple lives her true passion of raising human consciousness and motivating families to live healthier, happier and extraordinary! Dimple resides in Milton, Ontario, Canada, with her supportive husband and beautiful daughter. She is truly grateful for the opportunity to serve. I am a Certified WISDOM Coach through Adventures in Wisdom. I use my passion for inspiring children, as a mentor, coach and ambassador, to empower and inspire them to make positive changes in THEIR world. I helps kids develop unwavering confidence, resilience, and self-esteem, so they can live their life with intention and direction. I am an award winning mentor and teacher who has been recognized for leadership, governance and student life. I have mentored and coached kids nationally through the Encounters with Canada program in Ottawa! As a Teacher, Coach and Mom, I see and live the struggle every day. Bullying, poor decisions, isolation, frustration, tears and pain - for the kids I'm raising, the kids I'm teaching and myself. The harsh reality of the world is visible everywhere. And as parents we're scared as hell. Families are busy, life goes fast and the next thing we know we have teenagers that are missing the confidence and resilience they need to navigate an ever changing world. Through the Adventures in Wisdom coaching for kids program, I give kids the space to develop essential skills so they can live a life of integrity and intention defined by their OWN personal values. I am a Saskatchewan Riders fan, love everything outdoors (minus the pesky bugs) and enjoy books. I've never been to Disneyland, but I've hiked through 7 European countries, solo, before the security of cell phones and Google Maps. Please contact me if you have any questions or to schedule an appointment. I remember the moment when I found out that I was going to have to repeat grade two. I felt myself sinking into a dark hole. Today I have a sociology background from Laurentian University. I am a career counsellor, a shelter worker and a support worker for disabled children. I help children with anxiety and academic issues develop high self esteem by teaching effective mind set skills such as overcoming failure, disappointment, managing change and decision making skills. I have had a career in healthcare for almost 20 years and have been on my own personal journey for the last 10 years. In 2017 I received my certification in life coaching both through Isaak Group and Canfield coaching Groups. I have held classes for both adults and children, both in school classrooms as well as privately. Some of the classes I have held were: Vision boards, How our thoughts affect us, the importance of loving ourselves, goal setting, personal responsibility. Going through all of the curriculum myself in my 30’s, I kept thinking ‘this has to be available to kids, in a form they can relate to!’ So when I found Adventures In Wisdom I was extremely excited! All of this important information in a curriculum meant for children. Being the mother to 3 young boys and seeing how the older they get the more they could easily fall into habits not serving them, I jumped on the opportunity to become a certified WISDOM Coach to teach children these skills. As I go through the stories with my own children I see the thinking processes changing and more thought going into ideas and new circumstances. I am seeing with my own eyes the difference these skills make in a young life. Brenda Norrie is a certified WISDOM Coach for kids and a Lifestyle & Empowerment Coach. She works with women and girls in her town of Maple Ridge, British Columbia to build a strong, empowered community! Together with community agencies, schools, youth groups and parents, Brenda works to build confidence, self-esteem and power in her clients. Brenda facilitates weekly programs, as well as daily workshops, community events and one-on-one coaching through her business Thrive Empowerment Solutions. Contact Brenda to work with her in helping your girl tribe feel strong, empowered and supported! I am Jennifer Shearer and I am so excited your here! I have founded The Looking Glass to help kids discover their personal super powers. I work with kids and parents to create powerful self esteem and to live each day with as much joy as possible as a family! As a mama of two little people ages 7 & 9, I witness every day, how insecurity in children leads to so many challenges. I also struggled as a child in school. So, it is my life mission to empower children to find true self acceptance and the confidence to move through the world on the clearest path possible within themselves! I am a Certified WISDOM Coach through Adventures In Wisdom, Life Coaching for Kids. I'm also, a certified Children's Fitness Coach & Personal Trainer as well as a License Owner to Danielle LaPorte's, The Desire Map which enriches peoples lives through simplicity around goal setting and self love! I have been teaching fitness classes to those who identify as mother and their babies since 2009. I am grateful to have been able to help empower parents and will continue to do so. I am excited to add to this adventure with kids while they are navigating through the challenges of school, making friends as well as the person they are becoming! Lisa Plumridge is a mum of two children, a girl and boy. She has a teaching career that expands 20+ years, where she has taught children of variable ages and abilities, ranging from 0-15 years. She is registered under the Queensland Board of Teachers faculty. Lisa has specialized in studying and working as a Special Needs and Learning Support Teacher, provided mentoring for training University students, fulfilled a team member position on the School Wide Positive Behaviour Support Team, taught in mainstream classrooms and conducted individual private academic tutoring. Lisa became a Certified WISDOM Coach in 2014 and started her own business in 2015 called Life By Your Design. Her passion and personal drive as a Life Coach and Teacher is to inspire, empower, and to embrace children’s uniqueness, where they transform and flourish into happy, confident and successful individuals. She wants children to develop a strong mindset that encompasses a VISION of possibilities, determination and direction, ensuring they align themselves with their true ‘SELF’. Inna lives in New Zealand with her husband and 4 amazing kids. As an adult she found herself on an incredible self-discovery journey that lead her to ask the question… “How can I teach my children these skills and how can I share this with other kids?" This lead her to become a certified WISDOM life coach for kids. She has worked with over 100 kids and families through workshops and private sessions to help support them and guide them to be the best versions of themselves. Inna is living her dream in teaching children and families self-empowerment and personal development skills so they can create happiness, confidence and success in their lives. Sandra is a certified WISDOM Coach, a Theta Healing and NLP practitioner and is very passionate about helping, parents and children. She has two children, a boy of 10 and a girl of 8 and experienced the benefits of the WISDOM stories with her own children. Helping children become the best version of themselves while remaining true to themselves and embracing their uniqueness is priceless. It’s all about teaching children, from a young age, a mindset and life skills that will make them feel more empowered, gain confidence and believe in themselves. Sandra also believes that good communication skills are crucial to foster good relationships through life and is a strong believer in Empathetic communication. Margaret Meyer has spent the past 30 years of her life working with children. She is a mother of four. The past 10 years she has spent working in primary school where she use her talents in a number of capacities: as a Nurse-First Aid Officer, Administration Officer and in Student Support. She runs programs for children who are grieving. Margaret has been a Nurse, worked in preschools and in child care running fun educational programs. Margaret is now blessed to be a coach, helping kids find inner peace, happiness and a will to thrive. She helps them to gain confidence and self esteem as well as a respect for themselves and others. She helps kids create goals and strategies to achieve their deepest dreams….and she loves it! Kylie has worked as an Education Support Aide in the Special Education field for 8 years. She has worked amongst children aged from Prep to Year 6 years old. Kylie’s students have had mild to severe Behavioural difficulties such as Autism, ADHD, ADD, Hearing Impaired and Intellectually Disabled. Kylie was able to create programs based on intuitive guidance and her extensive knowledge and passion for Mental Health and Well-being. Kylie is the founder and visionary behind Crooked House. Crooked House is a multi facility specializing in providing unique and much needed services in the Logan and surrounding areas. The business is taking shape to be the only of its kind in the area, striving to provide opportunities and experiences for our kids who are struggling within themselves. Kim is a certified WISDOM Coach, A Plan-it-Youth Mentor and a Mother of 5. She has been volunteering at the local high school as a mentor to year 10 students and loves to see these young adults grow with self-confidence. She has experiences with Epilepsy, Diabetes, other illnesses and other learning difficulties throughout raising her children as well as with family members. Kim thinks these life experiences have given her the grounding and knowledge which she now takes forward with her to help others through these difficult events that life sometimes brings. She realizes that everyone needs a mentor or someone to guide them to be able to see what is possible. We need to start working together to encourage kids to dream, set goals and just feel like life is for living not hiding away somewhere and that they can achieve anything. As her kids say “with Kim anything is possible”. I am passionate, fun, real and trustworthy with an infectious attitude that uplifts the people I meet. Having lived in 4 countries and having spent over 18 years in the corporate jungle, I became a full-time certified Life Coach and accredited Neuro Linguistic Practitioner to follow my passion for helping people. With this new-found passion for life I have coached thousands of people over the past ten years on spirituality, emotions, relationships, health, business/careers and finances, and I have also been training individuals to become life coaches over the past seven years. My dream has always to one day empower kids with the essential skills around self-confidence, self-worth and self-love so that they can create the life they dream of and be themselves. This is such a gap in the coaching field. I then came across the Adventures in Wisdom program which was the answer I was looking for. I became a certified WISDOM Coach. As a result, Be Your Truth was founded, that empowers both kids and adults to be their authentic self and to live the life they want! Kara’s passion for coaching young students is based upon her extensive experience in student engagement and support for a young person’s wellbeing. Having developed school mentoring programs and providing meaningful pathways and partnerships for students as well as seeing the need for supporting younger students to flourish Kara became a certified WISDOM Coach through Adventures in Wisdom. Kara, through her strengths based coaching approach and experience in building networks, is passionate about assisting young people to find their purpose and successfully transition from Primary to High School and from school to work and adult life. Kara feels that by supporting families, our young people will grow in confidence and develop the skills to find their life passion. With life coaching experience. Kara assists students in school to understand their mindset and become confident young people engaged in and loving their life. Kara also has extensive experience within the education, corporate and disability sectors. Fiona is a social worker and Certified WISDOM Coach, with over 15 years experience working with families, children and communities. She is passionate about supporting parents and children to live their best lives. Through Adventures in Wisdom, Fiona helps children to change their minds and design the life they want. I am an experienced teacher of English, a learner coach and a certified WISDOM Coach. I have been in the education field in the public school system for over 30 years. My passion for children and my dream to make a difference in education inspired me to found “Asociaţia 7x7 pentru Educatie”, an NGO involved in various educational events for over 5 years. As a teacher, I love helping children learn English through famous books and films suitable for their age. Stories offer a whole imaginary world, created by language, that children can enter into and enjoy, learning language along the way. As a learner coach, I love designing activities that help kids get motivated, organized and practicing their English in a fun and empowering environment. As a WISDOM Coach, I am passionate about how mindset skills work and about making a difference in children’s lives by empowering them with strong self-confidence and powerful self-esteem through stories from “Adventures in Wisdom”. Hello, my name is Olga Morozova, NLP Master Coach and Master Practitioner. I am the founder of MagicOn, an unusual company where using NLP and life coaching we guide individuals and small group expeditions into the future and back to explore, create and manifest the life our clients desire. I find it especially rewarding, working with children. As a certified Wisdom Coach for Kids I share the philosophy of success and growing mindset that enables children to be leaders in their lives so that they can create a happy fulfilling life regardless of their circumstances. I help children and adults, who are experiencing self-doubt, lacking confidence, not achieving their potential, create possibilities, learn how to make good decisions, find their vision and manifest the life of their dreams. Children coaching is still new in Portugal, so I am assisting all families that come to me in search for better understanding about how to help their children overcome life's challenges. I am helping kids, teenagers and their families to understand, nurture and express their uniqueness and drive their life from within. My dream and mission is to positively impact new generations by, with them, "unraveling WHO they already ARE". I am a 33-year-old wife and mother of two beautiful boys. I was born in Romania, but I have lived in Ireland for the last 10 years. I am multilingual as I speak, English, Romanian, Italian and some Spanish. I have a passion for learning about humanity, how the mind works, building self-confidence and managing and overcoming fear. My interest in coaching kids began when I had my first child. I realized that I have the life skills to help children as I have a deep understanding of what is necessary for proper development and helping children to reach their potential. I have a strong belief that we should be true to ourselves by following the path in life that we choose. Only you know what is best for yourself. I want to give children the life skills to achieve the best they can be. My motto is follow your dreams, fight and never give up. Jean Gibson is a certified WISDOM Coach as well as an adult Life and Career Coach. She is an associate member of the Chartered Institute of Personnel Development and is an accredited Flow Consultant. Jean began her formal coaching practice in June 2016 after a long career in Information Technology and Human Resources. With 4 grown up children Jean is acutely aware of the challenges kids try to navigate and how stressful and unhappy their lives can be. She also understands, from the perspective of parents, their desire for their children to be happy. Jean believes that coaching children from 8 to young adults with the WISDOM system life skills, they will have a firm foundation to grow into positive, courageous, self-confident adults able to fulfil their life and career goals. Jean works one-on-one and in small group workshops with children who lack self-confidence and have low self-esteem. She also delivers workshops and one-on-one sessions with parents, empowering them to continue supporting these young people. Contact Jean if you have any questions or to make an appointment. Hi! I am Catherine, the Coach at Fundamentals. I have been teaching in the international setting for the past 20 years. I design engaging and challenging educational programs in reading, writing, and mathematics for children aged 6 to 15 years old. The programs are tailored to each child’s unique skills, needs, beliefs, and interests. I strive to create a nurturing, supportive environment to develop a balanced school life. With my long teaching stints in the different schools in the areas of Metro Manila in the Philippines, New York City in America, Surrey in Great Britain, Istanbul in Turkey and Zurich in Switzerland, I have considerably rich experiences, various appealing stories, and provoking activities to share. I can work with you in your child's journey toward a fulfilling school life. What are you waiting for? Let us now take your child's journey to the next level! My name is Anne Rotschi. I am an engineer, a credentialed ACC coach and a certified WISDOM Coach. My purpose is to support kids, who we know are the leaders of tomorrow, and who will continue to build peace in this world. Up to this point, I have been coaching executives in the Oil & Gas industry. I often come across adults who have lost their self-confidence after being fired. Those experiences made me realize that it is difficult, as a grown-up, to deal with self-limiting beliefs and road blocks. The younger you become aware of this, the easier it is to work on it and to move forward in your desired direction. As a kid, I have personally experienced helplessness and lack of self-esteem. I wish I had followed the Adventures in Wisdom program as a kid. I am French and I am happily married with a 4 years old daughter. My clients are mainly French children who particularly need to grow their self-confidence. I am passionate about family, children and youth of South Africa, people, life coaching, tennis, sports, books, learning and development. I am the wife of a great sportsman who achieved at the highest level. I am a mother of a son and daughter who secured International scholarships for sport through UK and US Universities. I play Premier league Tennis. After 30 years in a stressful, corporate work environment, including senior positions, I made the choice to reinvent myself and to lead an energized, inspired and passionate life. My goal is to coach kids to ensure critical life skills for developing strong self-esteem, powerful self-confidence, overcoming challenges (i.e. fear, disappointment, change), a vision for their lives and achieving their goals. Coaching packages typically involve four to six sessions (+ -1 hour each) and can be delivered one-on-one or as a small group session, such as per sports team or class. Bwalya was an inquisitive child, always asking questions and, more often than not, she did not get the answers she was seeking. It took many years for her to discover and learn that most of these answers were already within her. Bwalya has a career that spans from economic development and financial inclusion projects to working on women and youth empowerment. The most rewarding work she has ever done was when she mentored 13-18 year olds under the British Council’s International Climate Champions Programmme. Bwalya later set up a creativity camp with the help of her now teenage daughter. The camp is for children aged 4-14 and is called Artistic Thursday. Now, a certified WISDOM Coach, Bwalya runs weekly creative camps. She helps young people to trust and be guided by their inner compass and find the answers within to the questions they are seeking. Bwalya also conducts one-on-one coaching sessions with young people, which offers a safe, happy and creative environment to allow children to realize their potential, creating tomorrow’s leaders today. Having lived every child's dream by traveling with a children's circus around the world starting at age 11, Kirsten Brissett found her passion to empower and inspire kids from all walks of life to discover their full potential and go for their dreams. Kristen said, "It was in the circus ring that I discovered my love for coaching and helping kids to overcome challenges, get back up and believe in themselves." Kirsten felt she was an ordinary child with no special talent, but through her positive mindset and determination, she dared to dream and not only become a professional trapeze artist but an EXTRA-ordinary kid as well. Kirsten is a Certified WISDOM Coach and has a coaching company KidsUnqiue. She is passionate about facilitating children’s groups to encourage children to reach their full potential. As an ex-professional trapeze artist and teacher in creative activities, she empowers children through innovative interventions despite challenges in their environment. Her years of experience in the Zip Zap Circus as well as being a full-time children’s pastor have given her opportunities to train, equip and teach both children and adult leaders in areas of spirituality, family and value systems. Fiona is a mother of four children and a grandmother to six amazing grandchildren. After more than 40 years in the corporate world, Fiona is using her mentoring, coaching and guiding skills to make a difference in the lives of children. Using the successful adventures in WISDOM coaching programme, she empowers tweens with the essential skills and tools to navigate their complex journey through life. Fiona uncovers, nourishes and grows the strength and capabilities within children so they stand in their power and achieve their dreams. She founded Growth Box: Yz Kidz in 2017 and works with children from the ages of 8 to 11, using the fun, exciting and comprehensive adventures in WISDOM coaching programme. Coaching includes personalised 1-on-1 sessions or small groups; workshops; information sessions. She actively encourages engagement at public and private schools, churches and after-school facilities. This programme stimulates academic and sport achievements and integrates seamlessly into other holistic programmes. Shine Thru provides a safe environment for girls to develop their self-awareness, which promotes personal growth and will be greatly advantages when faced with big life decisions, directly impacting their future. Self-awareness will help your child to explore her inner self and shine a light on the cause and effect of her thoughts, emotions, beliefs, habits, words and actions. She will develop a thinking skill that focuses on her ability to accurately judge her own behaviour and performance. Possessing self-awareness will help your child tune into her emotions (developing her Emotional Intelligence) and help her respond appropriately to different social situations. Shine Thru’s main focus is to empower girls with growth mindset tools and transformative life skills to develop, within themselves, healthy self-esteem, positive self-confidence and strong self-efficacy to live their lives with courage, freedom and love. As parents we cannot give these qualities to our children, but we can certainly take steps to help them to develop them within themselves. By participating in Shine Thru Life Coaching Programs, your child will gain a deeper understanding of her own self, character, values, and purpose in life. She will also be more aware of her limitless potential and what actions steps she can take every day, to make her big dreams come true and enjoy a healthy and happy life. I welcome you to meet with me to discuss your child’s unique needs or to get in touch for more information on one-on-one coaching, small group coaching, workshops and special packages available. Jenny is the owner and founder of New Heights Life Coaching Consultancy. Jenny is a certified WISDOM Coach for kids through Adventures in Wisdom and a certified Life Coach for Adults through New Insights Life Coach training. She also has her certification in early childhood education, level 1 gymnastic coach and basic counselling skills. Jenny believes that becoming a certified WISDOM Coach has empowered her to coach children with confidence, walking a path with them, showing each child how to develop life skills such as building self-confidence, recognizing negative self-talk, understanding the power of your mind etc. Jenny has been involved with supporting children with a variety of challenges, such as abuse, alcoholic parents, divorce and general life skills development throughout her adult life. She has also, assisted young adults adapt to adulthood, overcoming fears and limiting beliefs. Jenny is passionate about working with adults and children as she believes each individual is able to tap into their own potential and learn the necessary life skills to lead a happy and fulfilled life. Jenny believes that we can all heal from emotional wounds and establish a positive self-image. She works with children or adults in small groups as well as one on one. I am an ICF Certified Life Coach, NLP Practitioner, Psychotherapist and School Counselor. I have been working with kids and teens for the past 15 years and that has given me a great understanding of them and their world. I believe that each child has huge potential. All we need is to channelize their energy properly. Through life Coaching, I empower children to tap their real potential and live their life to the fullest. I am also a Reiki Master, Tarot Card Reader and into Tarot Coaching and Teaching. I am now a certified WISDOM Coach. I coach kids through the Adventures in Wisdom curriculum that helps them learn to build positive self-esteem and self-confidence, handle their emotions, make good decisions, use the power of their mind to achieve their goals and dreams. I conduct coaching sessions individually, in a group, one-on-one and through Skype. I also conduct workshops for children, teachers and parents. Leila Atbi is a Master NLP Coach, with the Robert Simic Coaching Institute (RSCI), an accredited International Coaching Federation program. She holds advanced coach training certificates with RSCI and with Dr. Mohamed El Tayeb Activity Based Coaching Training Institute. She is a certified Wisdom™ Coach for kids and teens, a certified Thetahealing™ practitioner and a certified RSCI Master Hypnotist. Prior to becoming a life coach, Leila graduated from Paris Sorbonne Abu Dhabi with a Masters in Linguistics, has a B.Sc in Biology from Algiers University of Sciences and Technology and is on ongoing doctoral studies in Education. She speaks fluently French, Arabic and English. Leila is a happy mother and spouse. She has been coaching and mentoring her students for over 15 years and is an active NLP Coach for over 2 years. I am a professional life, youth and family coach and a certified WISDOM Coach from Adventures in Wisdom. My passion is to help people and bring peace and harmony to all homes. After spending over 15 years working in different positions and teaching music I feel fortunate to have found my calling as a coach, and am passionate about making a difference in other peoples’ lives. I enjoy giving workshops for parents and children. My dream is to spread peace of mind wherever I go. Meena Gajria Furtado is a Mindset and Leadership Coach as well as the founder of Mission I AM, which is a program dedicated to building up young people from the inside out. Meena is a trained NLP Practitioner, a certified WISDOM Coach as well a Certified Trainer with the International Institution of John Maxwell Team. She has also served as a volunteer with the Growing Leaders Foundation. Prior to Coaching, Meena had a fulfilling career for 18 years in banking. She has held numerous high-ranking positions and worked in various areas including sales, client servicing, E-business and product management. As a Business Portfolio owner, she has lead several projects and product launches from ground zero and scaled them systematically using process, system and technology. Being a lifelong student of personal development, Meena chose to follow her passion for mentoring young kids to help them embrace their true identity and reach their full potential so they can improve their lives and find the inner courage to overcome challenges quickly. She is a mom to two wonderful kids and finds working with children most fulfilling. Meena takes pride in her ability to connect with kids as they transform into confident, resilient, caring and responsible individuals. Her personal mission is to ensure all children have the right set of skills, believe in their inner potential and are able to say of themselves, "I am", "I matter", "I can" and "I will'. Meena feels blessed to be able to do work that leaves her feeling proud and fulfilled. Najla is a Certified Conscious Parenting Coach, a Certified WISDOM Coach for kids and teens and a Certified RSCI Coach/NLP Practitioner, changing lives and reconnecting families. She helps guiding parents to a deeper connection with their children, empowering parents to raise compassionate, courageous and curious children through transformational tools of conscious/mindful parenting. She is passionate about empowering children with a strong sense of self-worth, internal motivation and empathy. She helps children develop a growth mindset in order to thrive in their life. Through individual and group coaching, online and in-person classes, circle groups and workshops, she inspires parents, teachers and children to live more authentically, to reduce their stress levels, to find more joy and to develop a close connected relationship. Would you like your child to develop soaring self-esteem and powerful self-confidence? Perhaps you have concerns about the choices your teenager is making, or how they may cope with peer pressure? Is fear, of some kind, preventing your child from realising their ambitions? Then I would love to help. As a passionate mindset and life coach for children, I am dedicated to creating positive change for individuals, families and communities, by sharing my knowledge and experience on how to maximise happiness, realise personal fulfilment, and develop emotional resilience. I use a variety of skills, resources and coaching techniques, depending on the needs of the client. I offer individual coaching, small group sessions, and community workshops. I welcome you to connect with me so we can explore if I am the right person to support you. I live in Jeddah Saudi Arabia and I am a mother of 3 beautiful boys. I started my journey with Kids Life Coaching when I felt that my 7-year-old boy was acting up in school. Later on, I realized that he was influenced negatively by his peers and I didn't know how to deal with it, so I started searching or answers and ended up realizing the working with a coach was the best way to help him. 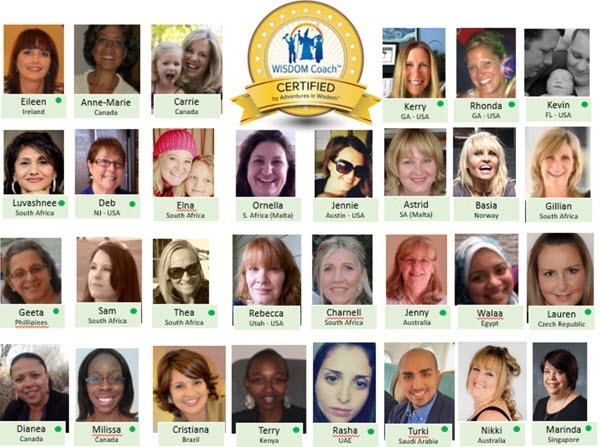 I decided to become a Certified WISDOM Coach with Adventure in Wisdom because they use an awesome method in connecting with kids. After hearing positive feedback from my son's school, I wanted to help other parents and children. I am really enjoying coaching kids and helping families! I am passionate about this work and looking forward to coaching more and morekids. CEO of KON Arabia for Coaching and Consultancy. Certified Coach and consultant in Relationships, Parenting, Child Development, Life Goals and Dealing with Obstacles. Certified MARS VENUS® Life & Relationships Coach, from Dr.John Gray “the relationships expert and the Author of more than 20 top selling books like Men are from MARS and Women are from VENUS and Children are from Heaven" . Certified Adventures in WISDOM® Parenting & Child Development Coach, as the first Saudi who get the certification. Certified TPS ® Life Coach. Over 3,000 Hours of coaching/counseling with clients from around the world across all age groups. More than 15 years of Experience in Multinational, Regional and Local Companies. Provided counselling and coaching sessions in ACT (Adult and Child Therapy Center) for 2 years and in KON center for 1 year. Public Speaker in Local and Global Conferences and forums. Provided multiple workshops and trainings related to Relationships, parenting, Child Development and other fields in the region. Married and a Father of 3 Children. No Coaches For this Area.